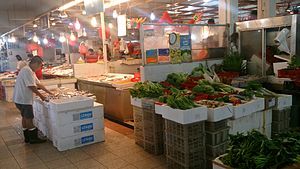 A market is a place where people go to buy or sell things. When people have products to sell, they set up a market place. There may be a special building for the market place, or the market may be held in an open space where the sellers can put up a stall (like a kind of tent) and then take the stall down at the end of the day. The word market can also have a more general meaning in the economy. It can mean the way things are bought or sold. "There is a big market for dishwashers" means that lots of people want to buy dishwashers, so therefore a business that makes dishwashers is likely to be able to make a lot of money. When things are sold, people buy the product, and this "stimulates the economy" (helps people to spend and earn money). The market needs to balance supply and demand. There is no point in supplying (making) lots of dishwashers if people do not want them. In the market prices may change quickly if supply or demand changes. If a seller of a good cannot supply what customers want or ask for too high of a price, other sellers may try to supply that good. If other sellers enter the market for that good, in competition, that will tend to fulfill demand and lower prices. Sellers who do not like competition may try to kill the competition. This would establish a monopoly, and many countries have laws to protect the free market against such practices.